JABEZ HOWES (1869) The sloop Jabez Howes was lost some time before July 10, 1869 in the Black Fox Islands of Alaska. JAMES A HAMILTON (1889) The 74 ton 82 foot wooden whaling schooner James A Hamilton was lost during the whaling season of 1889. Newspapers report the James A Hamilton (J A Hamilton, Hamilton) departed California March 3, 1889 bound for Unalaska with her whaling crew and three passengers for the schooner Angel Dolly; Captain John Lee, a mate and a seaman. The James A Hamilton was never heard from again. Lost were her Captain – Alfred Ryder, First Mate – John Gifford, Third Mate – Thomas Foster, Boat Steerers – Peter Johnson, George Warren and Charles Fitzgerald, Seamen – Charles Frestrain, George Penson, William Brightman, John Wilson, Thomas F Quirk, Steuart Charles Thompson, John Santos, William Dodge, Alfred Christian, and Jas. Jackson, Cook – John F Bookey, Cabin Boy – Zachriah, and the three passengers. The James A Hamilton was valued between $10,000 to $15,000 at the time of the disaster. Comment: The 81 foot schooner Otter and 57 foot schooner Annie were also lost with all hands along the same route the same time. Rumors circulated that the three were lost in the gales of late March. JAMES G SWAN (1903) The 44 ton sealing schooner James G Swan foundered and was lost June 30, 1903 along the Alaska Coast. The vessel was built in San Francisco in 1865 and valued at $6,000 with cargo at the time of the loss. JEANIE (1913) The steamer Jeanie wrecked December 19, 1913 at the south end of Calvert Island, Queen Charlotte Sound. JENNIE (1903) The cannery steamer Jennie stranded and sank at Denman Island in 1903. JOANN (1979) The 86 foot vessel Joann sank April 18, 1979. All crewmen were rescued by the Yankee Clipper. JOHN A COONEY (1934) The 30 ton 55 foot wooden oil screw cod fishing vessel John A Cooney foundered at Nashawena Island April 4, 1934. 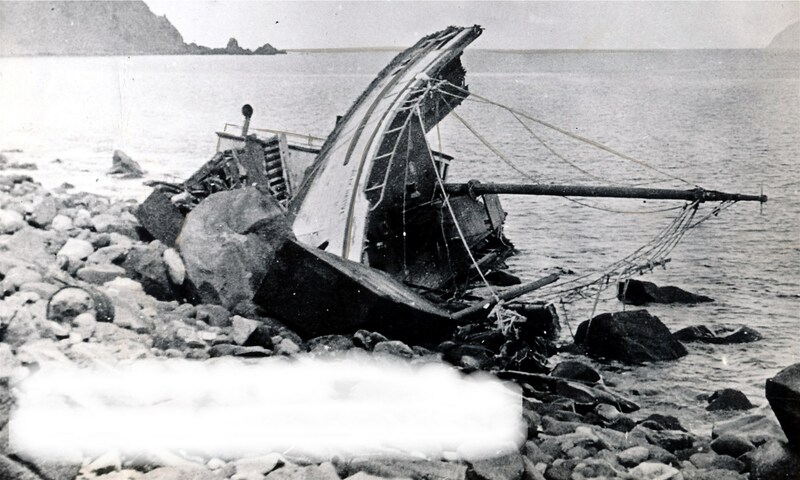 This wreck is reported as happening in Alaska on the 1934 Merchant Vessels Lost list but it is possibly Nashawena Island in Massachusetts.